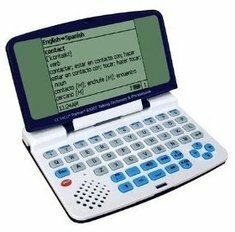 Category: Ectaco Talking bilingual electronic dictionary and Phrasebook, pocket-size. Fast, easy, and affordable, the Partner 500 series by Ectaco is a great language resource for those on a budget. Lightweight and portable, the P500 electronic dictionary can fit right in your pocket so you can take it anywhere. Looking up a word in any language is effortless, just type it in and you can see the translation right on the large LCD screen. Loaded with thousands of words, the EV500 will find almost anything you are looking for. Also the massive 14,000 entry phrasebook makes communicating a breeze. Just pick a category, find a phrase and you’re set. Loaded with sophisticated TTS (text to speech), this talking dictionary will be able to say words and phrases with the touch of a button. You get hours of usage with just 2 small AAA batteries. Whether you’re starting to learn the language or you just need a quick reference the P500 is exactly what you need. Just type in English or Vietnamese using the bilingual keyboard and get a translation, definition, part of speech, gender, and many more grammatical references. If that’s not enough, the Phrasebook function has 14000 phrases to list and select with a perfect translation for each. Word lists for help with the SATs are included with the Top 200 and 5000 most sophisticated words.